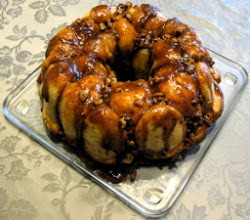 Place frozen rolls into a bundt pan, sprayed with cooking spray. Mix all dry ingredients and spoon over the rolls. Slice butter and place pieces throughout the frozen rolls/dry mixture. Cover with foil and allow to sit out for 6-8 hours or all night (the rolls will thaw and rise). Bake uncovered for 25-35 min in an oven preheated to 350 deg. Flip the bundt pan over onto a plate while still hot. Your presentation on your website makes this yummy bread even tastier! My family loves this for brunch or anytime. It's so easy to make and makes the whole house smell good!